The Progressive Right: Wait ... The Premier Needs a Fly Swatter? 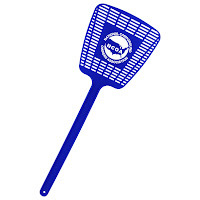 Before you give me heck, you have to at least give me credit in my last post for not drawing the obvious connection between the Premier's promise breaking and his need for a fly swatter. I am, however, surprised he didn't buy a shovel too ... what with all the, um, shoveling.